This top vent kit by Napoleon provides the parts to create the direct vent in your wall and connect it to the top vent on your appliance. 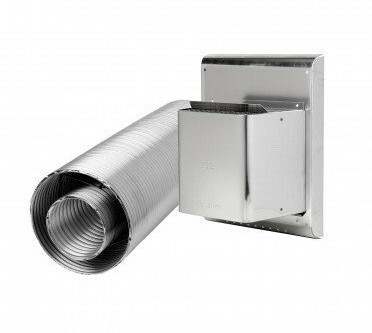 The kit includes one five foot length of flexible 5" x 8" direct vent pipe and one GD422 wall terminal/vinyl siding shield. If a longer length of pipe is needed, an alternative kit with 10 feet of the pipe is also available. The parts in this kit will work beautiful with your Napoleon direct vent fireplace because they are designed by the same company. What is the max heat rating for this flex pipe? Per the manufacturer, this pipe is rated for use in applications that will achieve flue gas temperatures of no more than 450 degrees. Higher temperatures will not damage the pipe, but will cause the listed clearances to no longer be safe. Can this flex pipe be cut if the whole length isn't needed? Yes, this Napoleon flexible direct vent pipe can be cut to the size you need. This product has served its purpose to the full potential. We use our fireplace all of the time now and it heats our basement/family room area. We have had no problems with the product. My husband was able to easily install within an afternoon for our use of the product by the next day. We also received the product in an extremely timely manner.